Composite decking is one of the most important aspects of home improvement. Home owners built decks with the idea of it being a gathering place for friends and family. A deck acts as the midpoint between the indoor house and your lawn so it is crucial to have an elegant decking for your home as it will complement both the indoor of your house and your lawn. It can be an amazing spot to sit and enjoy during BBQs in the summer. You can also enjoy some great conversations with your friends while sitting on your deck at night and drinking beer. The benefits of Trex Decking are nearly endless. Basically your deck can be considered as the main entertaining area for your yard. Before planning about getting a deck built at your home you should first take in to consideration all factors like the shape of your lawn, construction style of your house, material used on the exterior and interior of your house and much more. There are many different types of composite decking out in the market however Trex decking is known to be one of the best brands. There are several different composites eyeing the top spot in the industry however Trex beats all other composites by a long shot. Trex decking is so popular that in some parts of the world composite decking is referred to as Trex decking! This follows the same analogy of Xerox and Hoover. As mentioned earlier, you should consider several different factors before making the decision to build a deck at your home. After you have carefully observed the factors related to your home, then comes the decision of choosing a cost effective composite decking material and service. You might have a lot of options out in the market however this should be kept in mind that past home owner experiences have shown that Trex decking is the best type of composite decking. The importance of Trex Decking can be judged from the fact that it offers several different benefits to homeowners. Let’s take a look at some of the benefits of Trex decking. Trex is known to be a high performance composite for decking. Trex is not just known for its beauty and elegance, it is also a very strong material that can be used to build an extremely durable deck. In fact Trex Decking is known to be one of the most durable types of decking. It can last longer than any other type of composite available in the market. It is also known to be resilient against intense pressure and temperatures. Where real wood gets worn out in things like rain and snowfall, Trex stands strong. A lot of people believe Trex Decking to be a very expensive type of composite decking. This couldn’t have been further from the truth. One of the best techniques marketers use in promoting their product or services is that they only mention the upfront price. You might find a product that is relatively less expensive at start but might cost you more in the long run. You can find several different composites in the market that might cost you less at start but you might have to spend thousands in maintenance cost in the long run. Trex is relatively expensive at start but it is more long lasting and durable in the long run. The maintenance cost associated with Trex Decks is very little. Trex decks do not get damaged by water and can be easily cleaned with a help of soap and water. One of the most important concerns of everyone these days is the environment. Over time people have started to become more and more aware about the threats that our lifestyle causes the environment. Trex is made from mostly recycled materials that include wood, sawdust, plastic bags, plastic overwraps, paper towels, toilet papers and many more household plastic items. It wouldn’t be wrong to call Trex Decking an environmentally friendly type of composite decking. When it comes to safety, Trex Decking is somewhat similar to other types of composite decking however Trex provides a relatively better experience to homeowners. You might need some tools to set up the decking however no nail goes through the deck itself which makes it a safe place to walk on barefoot. Trex is slip resistant, which makes it easy to clean with water. Unlike wood it does not have any splinters and can be walked on barefoot. You don’t have to worry about your kids playing on the deck as the modern decking is one of the safest home improvement experiences you’ll ever get. The benefits of Trex Decking aren’t just limited to the ones mentioned above. There are several other benefits that one can enjoy with Trex decking including enhanced house beauty and great social gatherings. 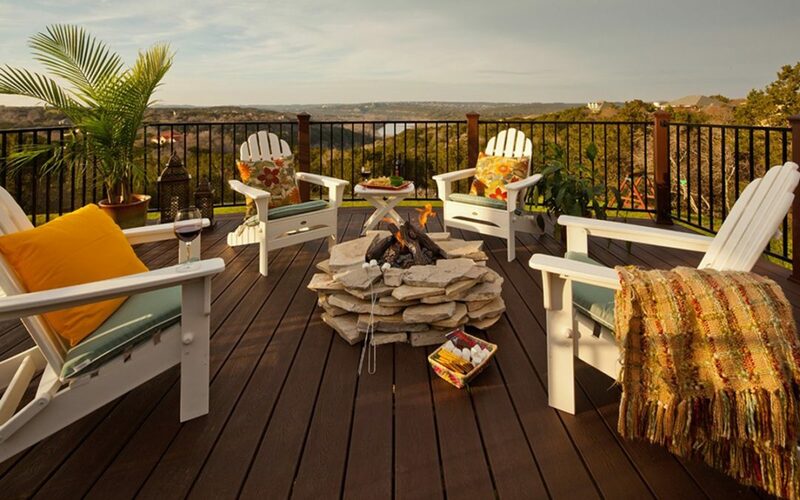 If you would like to learn more about Trex Decking and it’s many benefits, give us a call! Our experts can answer any questions you have regarding the product, and give you helpful tips for moving forward!